Trea Bertie put Racing Club ahead at NFK Burbage. 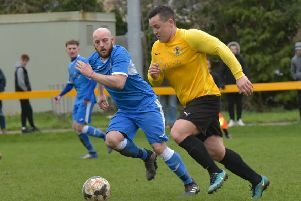 Racing Club Warwick were unable to bounce back from their defeat to Atherstone with a win after being held to a 1-1 draw by fellow high-flyers NFK Burbage. On a bitterly cold night at Kirkby Road, Racing Club started the brighter, moving the ball about well and got their reward in the 21st minute when a lovely through ball from Rich Powell was touched on by Scott Turner for Bertie who controlled well and rifled home into the far corner. An even, end to end game became more scrappy in the second half and the home side capitalised on an uncharacteristic error from Turner who miscontrolled the ball, allowing the striker to rob him before racing through to coolly slot past Charlie Bannister in the Warwick goal. Burbage came close to taking the lead a few minutes later but the ball grazed a post and despite good Racing Club pressure towards the end of the game, poor final balls restricted them to long-range efforts from Powell and Marc Passey. However, despite missing out on the three points, manager Scott Easterlow was happy with the application of his side, who remain in second. “There was more endeavour [than Saturday] and I can’t fault the lads,” he said. “We were laying siege to their goal but just couldn’t force a winner. “It was one of those nights when it just wouldn’t fall for us in offensive areas. Racing Club travel to Cadbury Athletic on Saturday.